Imagine the joy of hearing you’re pregnant! Now imagine having to cope with losing both your hands and feet? Such is the story for a Canadian mom, who after delivering her baby contracted a flesh-eating infection, leaving her in a medically-induced coma for two weeks — and with blackened, dying limbs. Lindsey Hubley and her fiancé Mike Sampson were thrilled to discover they were expecting their first child. 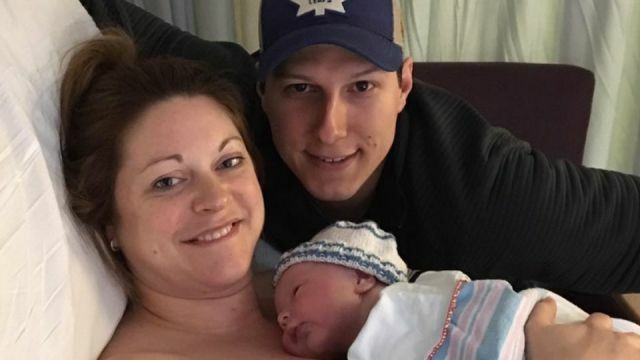 But then, several days after her son, Myles, was born, the 33-year-old mom from Halifax, Nova Scotia, was diagnosed with necrotizing fasciitis or flesh-eating disease. Necrotizing fasciitis, a serious bacterial skin infection, spreads quickly, killing the body’s soft tissue — and, if left untreated can be deadly. Although dubbed “flesh-eating infection,” there’s more than one type of bacterium that causes this rare disease. These bacteria include group A Streptococcus or group A strep, Klebsiella, Clostridium, Escherichia coli, Staphylococcus aureus and Aeromonas hydrophila, according to the Centers for Disease Control and Prevention (CDC). However, health experts believe group A strep is the most common cause of necrotizing fasciitis. This potentially deadly and disfiguring disease, that affects between 700 to 1,100 people each year in the United States, enters the body through open wounds. In Hubley’s case, the flesh-eating bacteria entered via a perineal tear she experienced during childbirth — turning her world upside down. Early symptoms of NF are often mistaken for the flu, which include high fever, sore throat, stomachache, nausea, diarrhea, chills and general body aches, according to the National Organization for Rare Disorders. This is likely the reason why Hubley’s infection was initially diagnosed as constipation by a doctor at Izaak Walton Killam (IWK) Health Center, the Halifax hospital where Hubley gave birth. However, unlike the flu (or constipation), a person with NF may also experience redness and pain, often occurring at an inflection point. Infection points might include surgical sites, cuts, scratches, bruises, boils or drug injection sites. Without immediate medical attention, the infection spreads, causing tissue to die, and can go on to trigger septic shock, organ failure and even death. Treatment then involves removing dead or infected tissue and, for some, like Hubley, entire limbs. Hubley was later taken to a different hospital, where she has undergone 23 surgeries including a total hysterectomy, the amputation of both hands and both legs below the knee, infected-tissue removal and skin grafting, she told Cosmopolitan. According to the lawsuit, the doctors gave Hubley an enema for constipation. “They didn’t properly examine her… If they had done that, our contention is, her injuries would not have been as significant as they are,” Wagner said. “She may have still had some issues, but they wouldn’t be anywhere as close to where they are now.” The family is seeking compensation to cover the cost of Hubley’s prosthetics. Meanwhile, Hubley shared her story, as per the allegations in her lawsuit, not to scare women but to encourage new moms to trust their intuition when it comes to their health. A GoFundMe page has been set up to cover Hubley’s medical and living expenses. Hey Buddy!, I found this information for you: "New Mom Loses Both Hands And Feet To Flesh-Eating Bacteria After Giving Birth". Here is the website link: https://www.thealternativedaily.com/new-mom-loses-both-hands-and-feet-to-flesh-eating-bacteria-after-giving-birth/. Thank you.